WWI: Fifty two months, fifty two posts – 20 – Gas! Gas! My Great-Uncle George was invalided home from WWI having been subject to a mustard gas attack. I don’t believe he ever spoke about what he experienced that day (and he died long before I was born) but I do know from what my Gran told me that his health, mobility and daily life were serious impaired as a result. As a child, with a vivid imagination and a tendency to dwell on such things, I was left with a terror of a cloud of chemical death, floating invisibly and inexorably towards me. 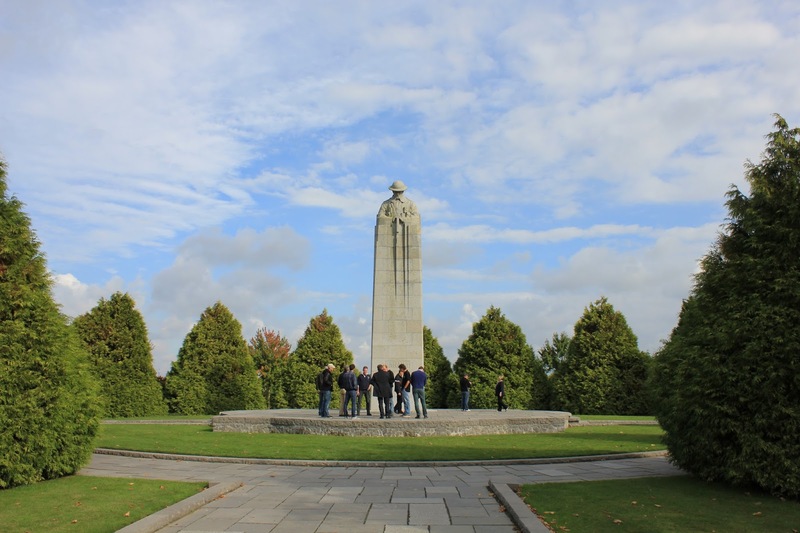 This is St Julian Canadian Memorial, situated at Langemark in Ypres, and the bushes planted around it are apparently meant to represent the gas clouds. It’s not obvious from my photo but when you see it from a distance, as you approach by road, the soldier does appear to be rising from a somthering cloud of green. In the display it is inside a bell jar and looks like a child’s glove randomly and inexplicably left in the exhibit. 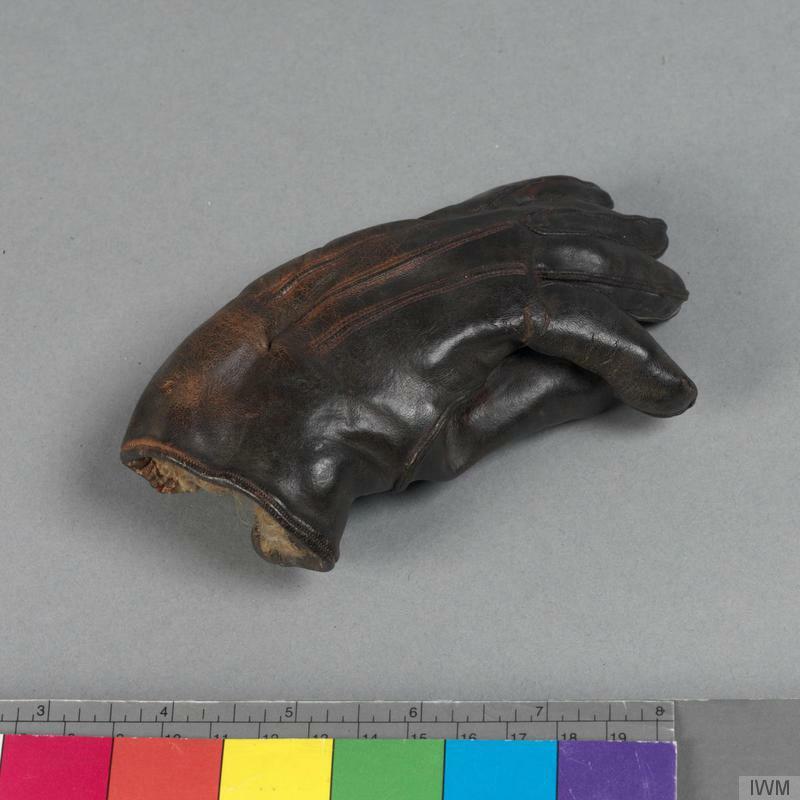 However it is, in fact, a leather glove that once belonged to an officer and the tiny size is due to shrinkage from gas exposure stripping all moisture from the leather. Just looking at it makes my stomach churn as I can’t help but imagine what such a gas would do to live skin. – Causes, unsurprisingly, irritation to the eyes. This was not deadly but rather an irritant designed to hamper troops instead of kill them. – Yellow/green or grey/green gas that is a powerful irritant, inflicting devastating damage to the eyes, nose, throat and lungs. At high concentrations and prolonged exposure it can cause death by asphyxiation. – Developed and first used by the French in 1915 (I cannot find the exact date/battle please tell me if you know it). – Colourless, with an odour likened to “mouldy hay,” phosgene is difficult to detect (making it a more effective weapon). Much deadlier than Chlorine it killed far more people, about 85% of the 100,000 deaths caused by chemical weapons during World War I. – It was often mixed with Chlorine to maximise the effectiveness of both since Phosgene is denser than Chlorine so the chlorine helps to spread the Phosgene. – First used by the Germans against the Russians at Riga in September 1917. – Has a yellowish brown colour and an odour of mustard plants, garlic or horseradish (hence the name). A vesicant, it is designed to immobilise rather than kill and its nature (heavier than air so would settle to the ground after release, turning to an oily liquid) meant that it could remain active in the soil for several weeks. – The skin of victims of mustard gas blister, their eyes become very sore and they began to vomit. Mustard gas causes internal and external bleeding and attacks the bronchial tubes, stripping off the mucous membrane. This is extremely painful and fatally injured victims sometimes take four or five weeks to die of mustard gas exposure. I was going to try and write a few paragraphs to properly encapsulate the horror felt by the soldiers on the front when gas was mentioned, but I think the above does a pretty good job on its own. So what I’m going to do instead is share two of the most widely known artistic representation of gas attacks in WWI (one written, one painted) and then urge you to read a very well written article that the BBC shared back in January 2015 on the subject (which unsurprisingly references both the representations I’m sharing). This is a description of a Chlorine gas attack – the green colour of the air and the description of the injuries mean it cannot be any other type. It must have been inspired from stories Owen heard whilst on active service, since he was never posted anywhere that suffered a Chlorine gas attack while he was present. In my opinion this fact heightens, rather than negates, the horror in the words. The scene is the aftermath of a mustard gas attack on the Western Front in August 1918 as witnessed by the artist. The article takes a very balanced view of the use of gas, talks eloquently about why that particular weapon of war was viewed with such horror, and looks at why gas was one of the only weapons to be banned as part of the Geneva Convention. I must add here that the cynic in me agrees with the assertion that part of the reason it was passed was that it was less effective than other weapons so less of a loss. It is worth a read, so without further do, here is the link – http://www.bbc.co.uk/news/magazine-31042472 – I hope you all find it informative!